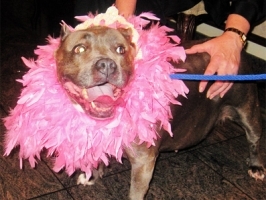 Ingrid the pitbull has an incredible sad story. When she was rescused by workers at the Little Shelter in Huntington, New York, the plucky little pup had 14 pounds of fluid in her abdomen. She was tied to a fence and used as a bait dog to incite fighting pitbulls because she was too sweet and submissive to fight back. Ingrid has a heart condition, which is another reason why she was a poor fighter, which explains the fluid build-up. She also had heartworms, to make matters worse. Fortunately, vets knew of a quick, easy fix to get her blood pumping again: Viagra. An interesting wrinkle is that whoever gets Ingrid also inherits a lifetime supply of Viagra. No, not your lifetime, Ingrid’s lifetime! That’s right, Ingrid might be the only dog in America taking more Viagra than the world’s oldest dad. She takes two pills twice a day, but thanks to local men on Long Island, she’s got enough blue pills to keep her blood racing. “Viagra opens up the blocked vessels that go to the heart so it allows the blood to flow through the body,” says Jodi Record, Ingrid’s current caretaker. Surprisingly, for all she’s been through, Ingrid’s major problem is that she has a little trouble getting around. Other than that, she’s apparently a sweet little dog and she’s looking for a loving home.